Toss the asparagus spears with coconut oil and some salt and pepper. Spread them out on a parchment paper-lined baking sheet. In a large bowl, mix the dressing ingredients (lemon juice, oil, mustard, maple syrup, and spices). 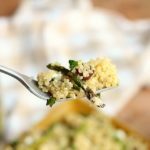 Once the quinoa is cooked and cooled, toss it with the dressing, olives, herbs, and pumpkin seeds. After the asparagus has roasted, cut the spears into one-inch pieces and toss together with the rest of the salad. Top with some crumbled goat cheese, if desired, and serve!